Laparoscopic surgery uses smaller incisions than does general surgery. 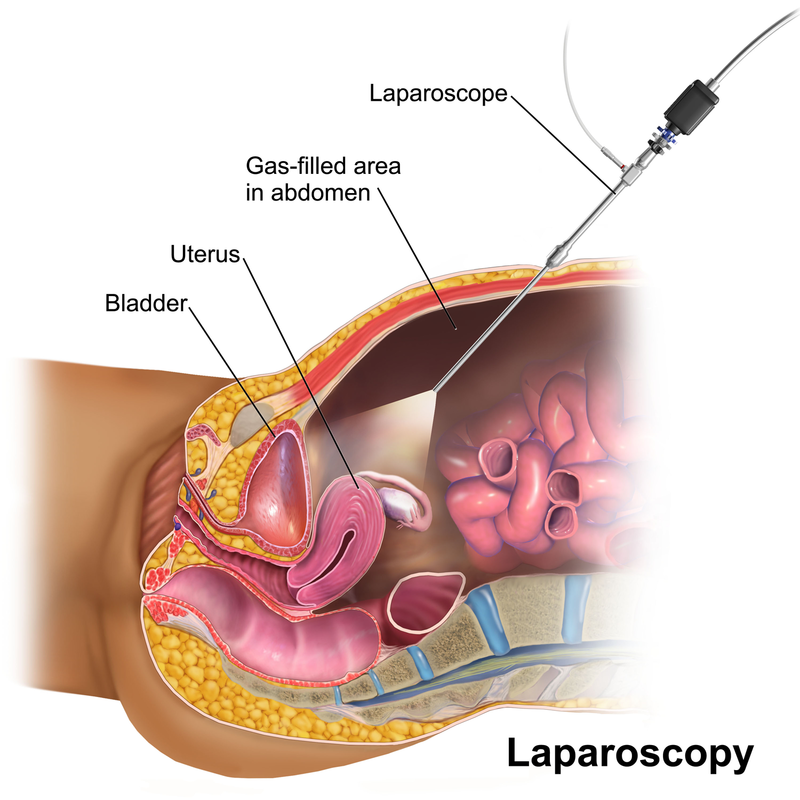 A device called a “laparoscope” is used, which has a small video camera and a light on it. The surgeon cuts a small hole near the area to be treated and places the laparoscope inside the body. The surgeon can then view what is going on inside your body without a large incision and without leaving a nasty scar. If you have a minimally invasive surgical procedure, there is a good chance that your surgeon will be using a laparoscope. Laparoscopic surgery was first used by gynecologic surgeons to treat pelvic scar tissue. The older style of surgery required a large incision across a person’s midsection. Doctors now use laparoscopes to perform surgery and take biopsies, too. Nowadays only a tiny incision is needed for many of the operations that used to leave significant scars. Laparoscopy remains a great way to see what’s going on in a person’s body, especially if other methods of viewing don’t work well for that patient. An MRI, CT scan or X-ray may still not give a doctor all the information he or she needs; a laparoscopy can provide the necessary information to make a diagnosis. One handy aspect of viewing these organs with a laparoscope is that treatment can occur as soon as a problem is found, in many cases. Some types of laparoscopic surgery utilize both the laparoscope and surgical tools to be used in the surgical opening at the same time. Sometimes the surgeon can also perform a surgery that lets them reach inside the body with their hands. This type of operation is commonly referred to as hand-assisted laparoscopy. While the scar is longer in hand-assisted laparoscopy, it is still much shorter than it would be using traditional surgical incision techniques. Hand-assisted laparoscopy remains an available technique that works well for organ surgery such as liver operations. Another type of laparoscopic surgery uses robotic assistance to allow complex surgeries to be performed with only small incisions. Robotic surgery, also called robotically assisted laparoscopic surgery, is a fast growing field with improved outcomes compared to open incisions for many patients. A patient needs to be honest about the medications they take and the general condition of their health with their doctor before a laparoscopy is done. People should carry a current list of their medications and supplements with them and share this list with their healthcare provider. Also, be sure to definitely inform your healthcare provider if you think you might be pregnant or are pregnant. The doctor who did your procedure will give the patient specific post-operative instructions after the process is done. If you would like to learn more about the benefits of laparoscopic gynecological surgery or robotically assisted laparoscopic gynecological surgery, speak to one of the expert physicians at All About Women MD today. We have offices in Gainesville and Lake City, Florida.